Consulting services: sample system and process analytical system design; system evaluation services. 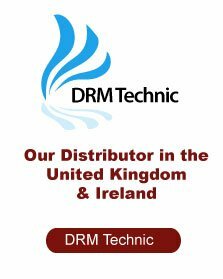 Our products have a long service history as integral components in analytical sample systems and in versatile utility applications. 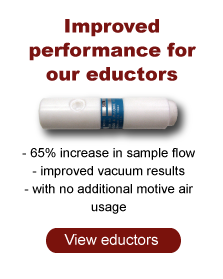 Our gas, air, and liquid aspirator, the Motiv-Air-Torr, has been in service for many years in chemical and petrochemical industries, refineries, pulp and paper, food and power industries, in water treatment facilities, on natural gas pipelines, and in environmental and safety monitoring applications. 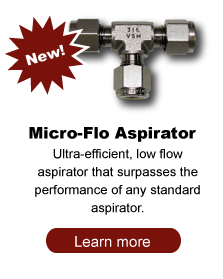 Our robust designs are easy to install, provide leak-free service, and have no moving parts. They provide low cost solutions with long-term reliability and no required maintenance. 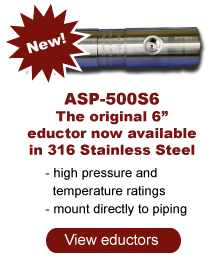 Looking for a degasser? 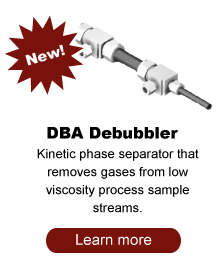 The DBA debubbler is a simple, reliable solution to removing gases from liquid samples. In addition to component manufacturing we provide consulting and design services based on more than 25 yrs of experience in design, installation and maintenance of process analytics.